A new study with icddr,b and collaborators is looking at how antibiotics are used by people in Bangladesh for illness in humans and also for their livestock and animals. In collaboration with Loughborough University, Durham University and the University of Bristol, UK the study, titled Pathways of antibiotic use in Bangladesh (PAUSE) has identified important behaviours around antibiotic use such as where people go for antibiotics, what illnesses they seek antibiotics for, and their understanding of how antibiotics work. 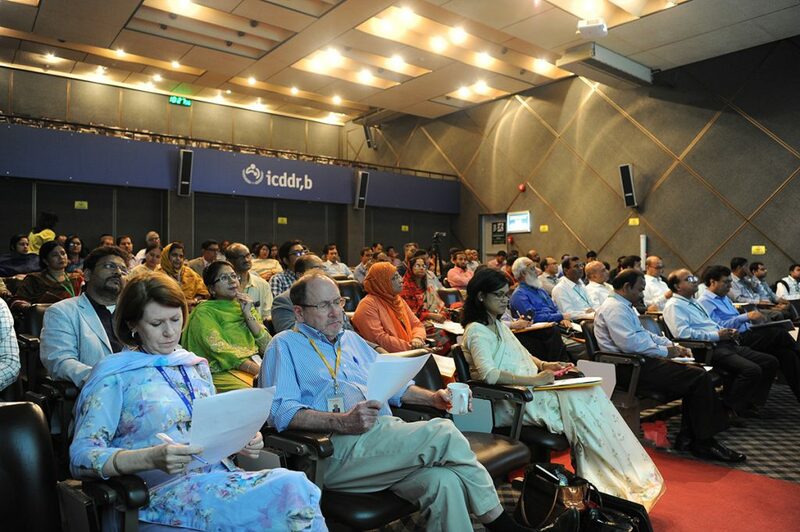 The initial findings were discussed at a dissemination seminar at icddr,b’s today to share insights regarding pathways of antibiotic use in Bangladesh. 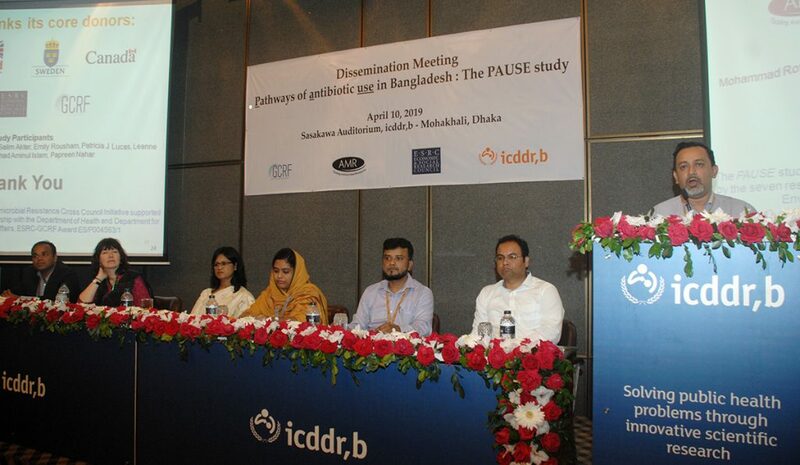 The dissemination seminar includes an overview of the PAUSE study by Dr Emily Rousham at Loughborough University, UK, following an overview of antimicrobial resistance in Bangladesh presented by Dr Aminul Islam, Adjunct Scientist at icddr,b and Assistant Professor, Washington State University, USA. The scientists have also shared ways to address this growing problem by using social and behaviour change communication messages and materials on appropriate antibiotic use. Antimicrobial resistance is an increasing global health challenge. The widespread use of antimicrobials, particularly antibiotics, has accelerated the spread of antimicrobial resistance (AMR). AMR occurs when a drug that was effective against a particular microbe causing disease is no longer effective against that microbe. Antibiotics are essential for fighting bacterial infections, but many bacteria are becoming resistant to antibiotics. 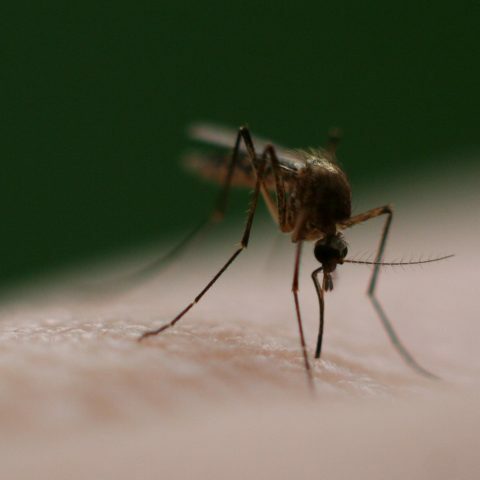 The study has interviewed 46 urban and rural healthcare providers ranging from qualified doctors and veterinarians to unqualified drug shop owners to find out the challenges they face in the dispensing and sale of antibiotics. In addition, 48 households from urban and rural areas were interviewed. With these insights, the team have developed strategies to improve antibiotic dispensing and consumption with the use of social and behavioural change communication messages. The research complements national policies to improve antibiotic use in Bangladesh such as the Bangladesh Model Pharmacy Initiative. Md Rofi Uddin at icddr,b presented the insights about household decision-making and antibiotic use for family members and livestock. Dr Papreen Nahar, University of Sussex, UK has shared findings about qualified and unqualified healthcare providers’ experiences of dispensing antibiotics and antimicrobials. Fosiul Alam Nizame, Associate Scientist at icddr,b presented prototype intervention messages and materials developed following the formative study which would encourage appropriate use of antibiotics and enjoying a healthy life. Fosiul Alam Nizame said, “We are now facing a situation where antibiotics may no longer be effective against organisms causing disease. We must promote rational use of antibiotics while giving households continued access to essential healthcare”. The Chief Guest, Prof (Dr.) Abul Kalam Azad, Director General of DGHS, MOH&FW attended the event along with Md. Salahuddin, Assistant Director, DGDA, MOH&FW and other stakeholder representatives.